As some of you know, my primary bucket list wine is Penfold’s Grange – the classic great Shiraz from Australia. One of these days, I will get a well-aged bottle and enjoy one of those legendary wine experiences, hopefully with a good friend. Note to self – probably NOT the 2011 vintage! Apparently, the latest vintage of the wine is not up to normal standards. 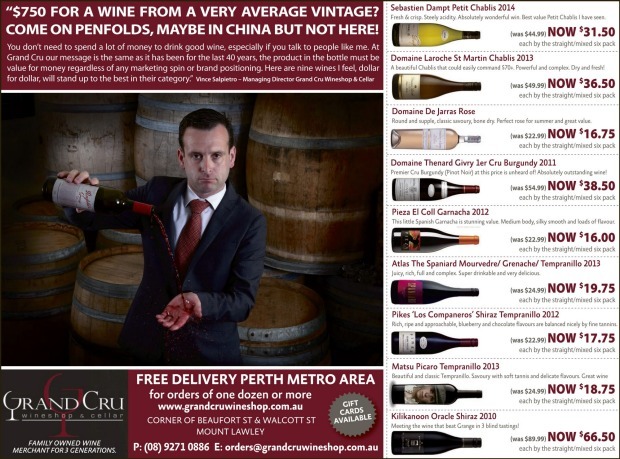 In fact, one Perth, Australia wine merchant poured two bottles down to sink to show his distaste for the current vintage (and to get a bit of publicity), according to an online article in the Australian Financial Review. A sad state of affairs. I just want to let the good people at Penfold’s know that I am available to give a second opinion on the 2011 vintage of their Grange.